GOVERNMENT has dispatched a reinforcement of soldiers to Luano Valley in Mkushi District to beef up other security wings stationed in the area to hunt for the three fugitive notorious Mailoni brothers who have continued to terrorise residents. The cold-blood killers – Mika, Fabian and Stephano – have been living in the valley while brutally killing people using spears. Last week, the three viciously murdered a 43-year-old man who now becomes the 12th victim. The Mailoni brothers are accused of brutally killing 12 innocent people in cold blood. Their victims include Zambia Flying Doctor Service (ZFDS) chief pilot, Moses Masumba. The Zambia Police Service deployed its men to the area to hunt down the alleged serial killers after they murdered their first victims in 2009, but this has not yielded positive results so far. The Mailoni brothers are also said to be responsible for the murder of Chief Chembe’s adviser, Christopher Nyama Champe of Shimpupula Village and Headman Mbalakawe Chipokolo of Shitambeni Village. In 2010, Government sent over 20 police officers to Luano Valley to beef up security and bring the alleged murderers to book, but to no avail. The Mailoni brothers are said to be taking advantage of their good knowledge of the vast forest to evade security officers. The infamous family of killers – led by a man whose real name is Katunda – murdered up to five people in the Mkushi-Serenje area in 2009, using the most primitive manner of bow and arrow, according to the police. What has been hard to understand is how the brothers have proved difficult to nail even when they are collectively going about with a K50 million bounty on their heads which the Zambia Police Service has staked for information leading to their arrest. A special paramilitary police task force was dispatched to the area in 2010 and recovered weapons which were used in the murder of Dr Masumba in the same area. Defence Minister, Geoffrey Mwamba said in an interview in Lusaka yesterday that the Government was concerned about the residents who were now living in fear of the notorious killers who had brought despair among the locals. “We have just sent a reinforcement of troops to Luano Valley and we are very determined to hunt for them and capture them. We shall not rest until we capture them. “As Government, we are saddened with the continued killings of innocent people at the hands of these brothers and this time we shall not leave any stone unturned but work in all areas to capture them,” Mr Mwamba said. Recently, Chief Chembe, who presides over Luano Valley, was quoted in the media as being a troubled man as he risked being a chief without people if the Mailoni brothers continued to commit atrocities. He said operations at three schools in Chembe, Liteta and Chinika and two other community schools had been affected as both pupils and teachers were scared of the notorious killers. But Mr Mwamba said the defence and other security agencies were on the ground in the valley to continue conducting operations to arrest the suspected murderers. “Our reinforced troops and other security wings will be there for serious operations to pursue these notorious killers. “I can assure Luano residents that Government is committed to capturing the suspects,” he said. Since 2007, the three Mailoni brothers, who were initially four before one retreated, had been on the police wanted list for murder crimes and terrorising the locals in the area. Mr Mwamba said the dispatched reinforcement of troops would join other security agencies such as the police already stationed in the hilly terrain of Central Province to pursue the killers. He said the Government was concerned with continued reports of some residents in the valley and surrounding areas who lived in fear and abandoned their fields and homes due to the killers. The Minister said the combined defence forces would mutually work as a team to strategise and explore effective methods to track down the fugitive and notorious brothers. Their time is near now! Send 10 commandos then if frm 2009 up untill now, no positive achievement has been achievd. ur phat azz will never catch them…. I would love the great bag of maize captured by the Mailon Bin Laden brothers. So our Kamfinsa and Zondela Baba trained graduates have failed to capture arrow and spear weilding villagers…and now constitutional defenders (Army) have to move in. What a shame to GBM who seem not to understand the difference between home affairs and defence ministries. wats wrong wth dspatching the Army, its part of their role ensuring there is security in the country! in other parts of the world, these brothers r considered terrorists!! Ha ha ha…they won`t catch them.They will only manage ngabakaye ubwamba. Zambian security forces? The same crap from whom 900 were captured, stripped naked and made to frog jump by Foday Sankoh’s 13year old toy soldiers in Sierra Leone 1998. The Mailoni brothers must be laughing in their katata! just to expose your foolishness @Livingstone. Foday Sankoh was born on 17 October 1937, in the remote village of Masang Mayoso, Tonkolili District in the Northern Province of Sierra Leone to an ethnic Temne father and a Loko mother. Sankoh was the son of a farmer. They were initially 4 before one of them retreated. Retreated to where? Is he in custody or what. LT conclude your news dont assume that everyone knows what happened to him. Can someone shed some light? you are right, i was asking the same questions too! Was wondering the same thing. How do they know he retreated and where the hell is he? How do they know they are three? there is more to these guys than just their knowlege of the forest, they probably use juju. TIA(this is Africa) remember adamson mushala? its indeed a sad thing to have our brothers and sisters living in fear for their lives. let the government do averything in their power to bring peace to luano people. The Mailoni Brothers must go for scared Kuwe GBM. not those innocent lives. It is GBM who has declared war on them not the innocent the brothers have been killing. And so the government(acting through defense minister) should sit back as people get slain? This is exciting to the soldiers.. going to Mkushi to eat some game meat, barbeque daily. And will leave many local school girls pregnant like they did in Western province. My advice is to take the PF thugs from streets of Lusaka, they will capture those tupondo. But the GBM’s Army??? Never, but its good for their training. Firstly i’ll dumb my strategy of capturing the maloni brothers as “OPERATION MONKEY”.if i was goverment i wld recriut some1 that knowz the geography of that place.The pipo that quilifies on my list are the hunters,poachers or medicine men. Phase 2, i wld go in with dog hounds and a helicopter mounted with a machine gunl.Belive u me, the maloni brothers will b smoked out of their hiding place. 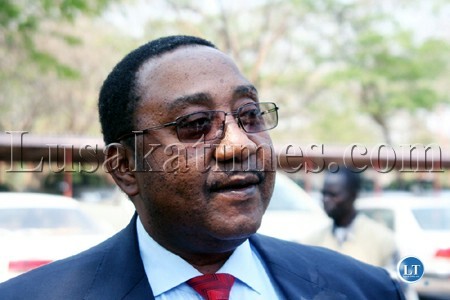 GBM how can you list Christopher Katongo on team to hunt for Maikoni brothers? Simply wrong. Where in the articles is Christopher katongo mentioned? Whatever you’re smoking please share? Ifya kubuta fye lyonse!primitve ifipondo ofyo mule tumina the entire army.Kwena tamwakwata fya kuchita.Ninchito yabakapokola iyo and, a simple one.Get snipers if u have any ,follow up the leads and shoot the *****s on sight. True true true, Katongo led the hunt for the capture of Africa cup and htey suceeded. So enlist him to capture these murderes too. masses sometimes the wrong thing would be the right thing to do. It will be field operations. Have we not got heat seeking devices in the army/police helicopters to pick them up wherever they are hiding? zambia police is only good at aresting UPND leaders. They are specialised at arresting HH but when it comes to real matters of their job they cant do it. Shame.May be these mailoni chaps are PF. Let the government hire my brothers from Chambishi Mine township. The Mailoni thugs will be captured and burnt to ashes, for real. Four suspected satanists were burnt to death yesterday in Chambishi. The Mailoni should be taught a similar lesson. ASHES TO ASHES, DUST TO DUST!!!!!! Guys this is serious. Some of you are making fun of this. This is not funny. Zambia is porous. The only protection we have is international law otherwise we can’t defend ourselves from any country or group. Leaders with no vision or ability. This points to the culture of non delivery we have grown in the country look at how people join these organizations, what kind of people they are, look at the work ethics of Zambian civil servants and most local private companies, look at the stances taken by our politician on various issues of national importance. I’m afraid the worst is yet to come, unless we change course! Mailoni brothers nimbwa capture them and send them to the galloz. From 2007 to 2012 hunting for 3 killers, doesn’t this expose our security and defence in Zambia? Do they really exist or it’s just differnt murders killing people at different times? on a serious note. This is a spiritual battle. These brothers are using charms and the strategy should be well defined. Just like we lost a lot of soldiers, police and innocent people during Mushala. Its not a joking matter, people are dying. Yes some people have hurt for GBM but lets look at the souls being lost. People wont cultivate and no longer productive. Hope our Lord help us stop this criminal activity. Always remember that God’s time is the best. The blood of those killed is crying to God and he has listened. They will be history soon. what is the latest news about the where abouts of the maloni brothers? these folks are probably on vacation lodging at a beautiful place in Mfuwe comfortably looking forward to their 13th victim….ifwe busy!